Our canvas prints can also be custom-made to suit your own size, photos or pictures. Welcome to contact us via mail or by "Sold by Warm Artwork" then "Ask a question"! 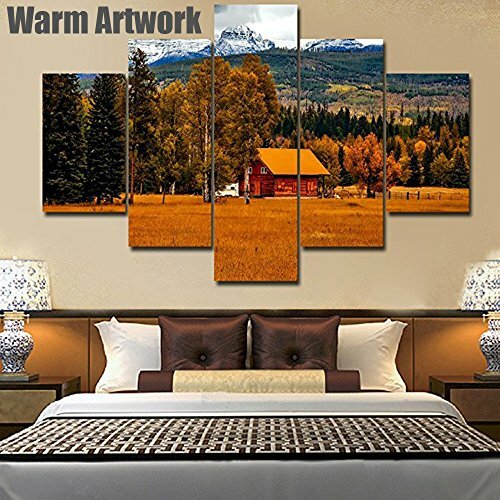 This wall art piece is more than general canvas printing poster, it is a unique piece of original artwork with stunning painted texture. A perfect gift for yourself and for loved ones,which designed for wedding, anniversary, thanksgiving, christmas, mother's Day, father's Day, valentine, birthday and others. The canvas designed for wedding, anniversary, thanksgiving, christmas, mother's Day, father's Day, valentine, birthday and others. We promise the items you received are to be in conformity with the advertised.If needs to purchase, please recognize the WARM ARTWORK Store. Otherwise, The quality of the product cannot be guaranteed. Top quality for home interior decoration idea or gift for relative and friends. Choose an perfect artwork which your friends and family will admire for years. A wonderful framed canvas art to hang in living room, bedroom or kitchen. The perfect apartment wall decor for any room you want to brighten up such as living area, office, or waiting area. High resolution printing on premium artistic canvas, by using a high quality mirrored gallery wrapping technique which extends the picture all the way around the wooden frame. This creates an immersive 3D effect and makes the printed artwork look great without adding an expensive additional frame. And metal hanging hook(s) already nailed on frame the canvas art is ready to hang out of the box. If you have any questions about this product by Warm Artwork, contact us by completing and submitting the form below. If you are looking for a specif part number, please include it with your message.